Romanticism originated in the latter part of the 18th Century and was the dominant cultural movement in European painting, music and literature throughout most of the 19th Century. It permitted the evocation of strong emotion, including trepidation, awe, and horror, as legitimate aesthetic experiences. Romanticism emphasized imagination and feeling. Rather than relying exclusively upon sensory experience, the Romantics believed that important elements of knowledge could be gained through intuition. Individual human imagination was recognized as a critical authority which permitted freedom from many classical notions of form in art, and allowed the overturn of many previously held social conventions. The movement contained a strong element of historical and natural inevitability in the representation of its ideas. 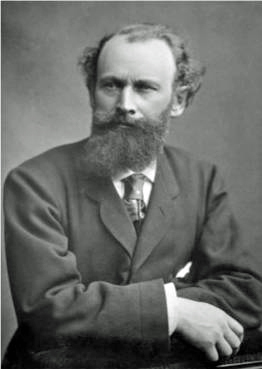 Romanticism stressed "awe of nature" in both art and language. Sublimity might be experienced through a direct connection with nature. The ideologies and events of the French Revolution probably were major influences on the movement. Romanticism singled out for praise certain people who were perceived as heroic individuals (such as Murat, Napoleon, Goethe and Delacroix), whose achievements were believed to have strongly altered the social order. In my opinion, Eugene Delacroix was one of the most important 19th Century French painters and is perhaps the greatest artist of the Romantic school. 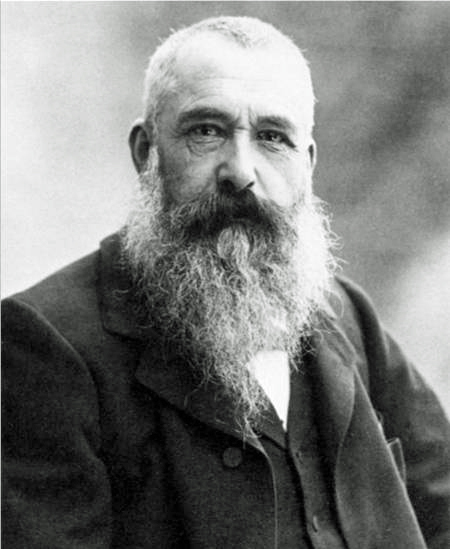 His use of color was influential in the development of both Impressionist and Postimpressionist painting. His inspirations came chiefly from historical or contemporary events. Delacroix's paintings were admired by many famous contemporaries such as Charles Baudelaire, James Whistler, Henri Fantin-Latour and even Edouard Manet. A year after Delacroix's death, Fantin-Latour painted a well known group portrait entitled Homage to Delacroix (see below). One of Delacroix's last major paintings, The Lion Hunt (1861), is a good example of his style (see below). Homage to Delacroix, by Henri Fantin-Latour, was completed in 1864, a year after the death of that famous French Romantic painter. This large oil painting, measuring about 62 X 98 inches, is on display at the Musée d'Orsay in Paris. The painting depicts a group of Delacroix admirers gathered around a portrait of that great artist. 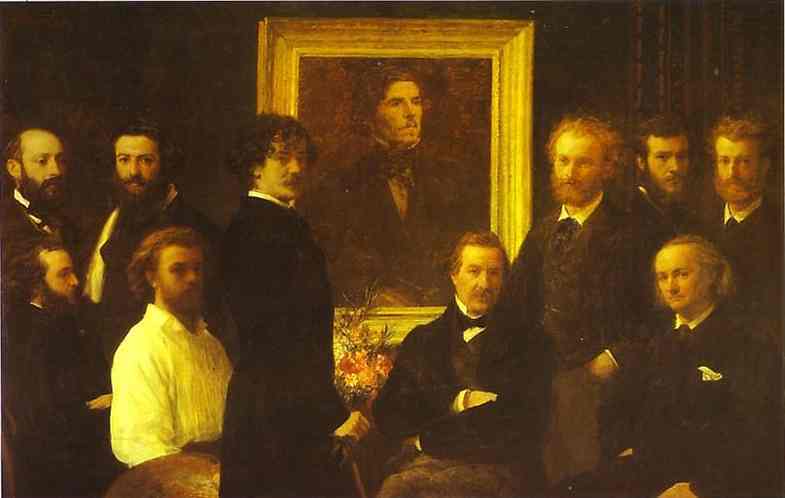 The people depicted in the group on the left are: first row right to left - James Whistler, Henri Fantin-Latour (seated) and Louis Edmond Duranty (seated); second row right to left - Alphonse Legros and Charles Cordier. The people in the group on the right are: first row left to right are Jules-François-Félix Husson who wrote under the pen name of Champfleury (seated), and Charles Baudelaire (seated); second row left to right - Edouard Manet, Felix Bracquemond and Albert de Balleroy. Delacroix seems to be gazing directly at Manet, as if to suggest that Manet would be Delacroix's successor as the leading figure in the French art world. None of the admirers are looking directly at the Delacroix portrait; instead, almost all of them look outward from the painting toward the viewer. The implication seems to be that the time has come to look toward the future and the possibility of developing new artistic ideas. In 1832, Delacroix accompanied a French embassy to the sultan of Morocco. While at Tangiers, he filled notebooks with drawings of local details, amassing facts for the many paintings with Oriental subjects that he would produce over the next 30 years. However, his Oriental pictures were never mere descriptions of local customs, for Delacroix believed that the artist's imagination should be an essential element in his paintings. 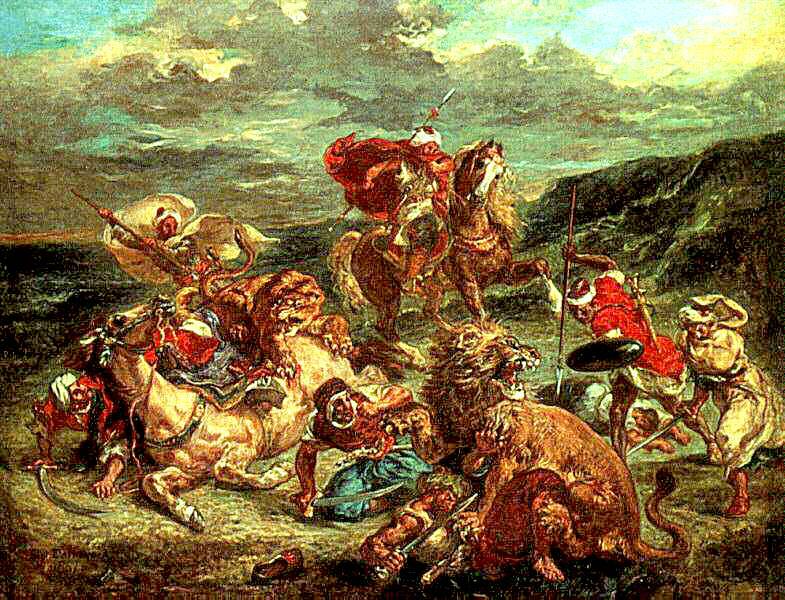 A late example of this, Delacroix's last major work, was The Lion Hunt, which he completed in 1861. The oil painting measures about 30 X 38 inches and is on display in the Art Institute of Chicago. It is a very Rubens-like picture filled with men, horses, and wild animals in rapid motion. Interesting details such as turbans and wild, non-European expressions are fused by the unreal color into a highly imaginative, but also very unrealistic vision. No real lion hunt ever looked even remotely like Delacroix's depiction!